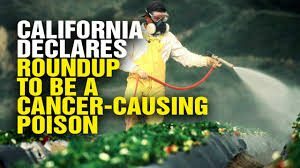 (Beyond Pesticides, April, 24, 2018) On April 19, 2018, an Appellate Court in California sided with the State of California, affirming that Monsanto’s glyphosate can be listed as a probable carcinogen under the state’s Proposition 65 and rejecting Monsanto’s challenge to law. The state will not only move ahead with warning labels on products that contain glyphosate but also prohibit discharge of the pesticide into public waterways. Monsanto’s lawsuit challenged the 2015 decision by California’s Office of Environmental Health Hazard Assessment (OEHHA) to list glyphosate, the active ingredient in Monsanto’s herbicide, Roundup, under California’s Proposition 65. Proposition 65 requires notification and labeling of all chemicals known to cause cancer, birth defects or other reproductive harm, and prohibits their discharge into drinking waters of the state. In 2015, the International Agency for Research on Cancer (IARC) of the World Health Organization (WHO) concluded that glyphosate is “probably carcinogenic.” Under the Labor Code listing mechanism of Proposition 65, substances identified by IARC must be listed in the state of California as known to cause cancer. This listing requires warning labels on products and the listed substances are subject to limits on discharges into surface waters. California added glyphosate to the list of cancer-causing chemicals in July 2017 but was challenged by Monsanto and its allies for carrying out the state’s law. Monsanto’s claim that the state was illegally delegating lawmaking powers to an unaccountable foreign agency, IARC. In rejecting that argument, the Fifth District Court of Appeal in Fresno preserved California’s authority to list glyphosate as a possible carcinogen. Presiding Justice Brad Hill said in the court’s 3-0 ruling that the U.S. and 24 other nations belong to a council that governs the agency. “[The agency’s] reputation and authority on the world stage — and relatedly its funding — is dependent, in part, on its work being accepted as scientifically sound,” Justice Hill said. He followed that the state, through its voters, had exercised lawmaking powers to require warnings on potentially dangerous products, and legally left factual decisions to an internationally supervised body. Monsanto has been hard at work trying to undermine findings that show its flagship product, glyphosate, is anything other than “safe.” However, its attempts to unduly influence and undermine scientific research and government review of its product has been disclosed widely in the press. This has prompted the European Parliament to set up a special committee to look into the European Union’s (EU) authorization procedure for pesticides, in light of their recent controversial review of glyphosate. It was reported that the European Food Safety Authority (EFSA) copied dozens of pages from a Monsanto study in reaching its conclusion that glyphosate is “unlikely to pose a carcinogenic hazard to humans.” EFSA’s recommendation was supposed to provide an independent analysis for EU member states when deciding to renew the chemical. Last year, the European Parliament banned Monsanto lobbyists from committee meetings and digital resources, as well as prohibiting Monsanto lobbyists from meeting with any Member of the European Parliament. This was an attempt to limit Monsanto’s influence on the EU review process amid mounting public pressure. In December 2017, the U.S. Environmental Protection Agency (EPA), declared that glyphosate is likely not carcinogenic, conflicting with IARC’s 2015 classification. Some charge that EPA’s assessment relied heavily on industry studies to arrive at its conclusion, and ignored its own guidelines for assessing cancer risks. EPA now has a public comment period open for its human health and ecological assessment which conclude that the agency is not considered with glyphosate exposures, despite evidence to the contrary warranting a precautionary stance on the chemical’s continued use. Action is needed to protect communities from glyphosate. Work to pass policies that restrict not only glyphosate but the entire range of toxic synthetic pesticides registered by EPA. Beyond Pesticides has resources to help you get started, including an organizing guide, model policy, and list of less toxic, organic compatible products. For more information on IARC’s glyphosate cancer classification and the IARC review process, see Beyond Pesticides’ article in our journal Pesticides and You. This entry was posted on Tuesday, April 24th, 2018 at 2:50 am	and is filed under California, Glyphosate, Litigation, Monsanto, Pesticide Regulation. You can follow any responses to this entry through the RSS 2.0 feed. You can skip to the end and leave a response. Pinging is currently not allowed.